Did you know that most cereals contain heaps of added sugar? Cereal can be a healthy part of your part of breakfast, if you know which one to choose. Download ShopWell to get personalized recommendations on cereals that are better for you. 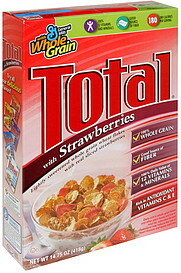 Whole Grain Wheat, Sugar, Calcium Carbonate, Freeze Dried Strawberries, Corn Syrup, Distilled Monoglycerides, Vitamin C (Sodium Ascorbate), Zinc and Iron (Mineral Nutrients), Vitamin E (Tocopheryl Acetate), A B Vitamin (Niacinamide), A B Vitamin (Calcium Pantothenate), Annatto Extract Color, Vitamin B6 (Pyridoxine Hydrochloride), Vitamin B2 (Riboflavin), Vitamin B1 (Thiamin Mononitrate), A B Vitamin (Folic Acid), Vitamin A (Palmitate), Vitamin B12, Vitamin D, Almond Flour, Walnut Flour, Freshness Preserved by BHT. Contains wheat, milk, almond and walnut ingredients.